We have expanded our unique healthcare approach and, with the addition of our in-home therapy service, our Keystone Health patients can now receive quality physical therapy in the comfort of their own home. Our exceptional physical therapists utilize cutting-edge techniques in conjunction with traditional procedures to alleviate pain and improve comfort for patients. As a current Keystone Health patient, you will benefit from enhanced care with the inclusion of this new care option. If you are solely a therapy patient, you will also experience the Keystone difference - which means you will no longer have the frustration or inconvenience of needing to travel to an outpatient facility, or spend time in facility waiting rooms until it is your turn. We tailor their care plans to fit their life circumstances and treatment wishes. Because of our proactive philosophy, we prevent many medical crises. A key component of our proactive model is care coordination. We have a team of care coordinators in the office connecting patients with service needs identified by their clinicians. Ultimately, what sets the therapy provided by Keystone Health apart from other physical therapy clinics, beyond providing in-home treatment, is our method of one patient, one therapist, for one hour. In many outpatient clinics, therapists will only work with the patient directly for 15 minutes before transferring care to a therapy aide while the therapist moves onto another patient. The advantage with Keystone Health is our physical therapists spend the entire time working individually with patients, thereby ensuring only the highest level of care is given. To find out if in-home physical therapy from Keystone Health is right for you, or to check if your insurance is accepted, call us today at 208-514-0670. Physical therapy is a service provided by trained and licensed professionals to develop, maintain, and restore movement and functional ability. In most cases, physical therapy is provided post-injury to restore function and prevent future injury, but it can also provide benefits for chronic conditions by increasing mobility and quality of life. A physical therapist has the ability to examine and assess the patient's needs and to evaluate those findings in the interest of creating a customized treatment plan. 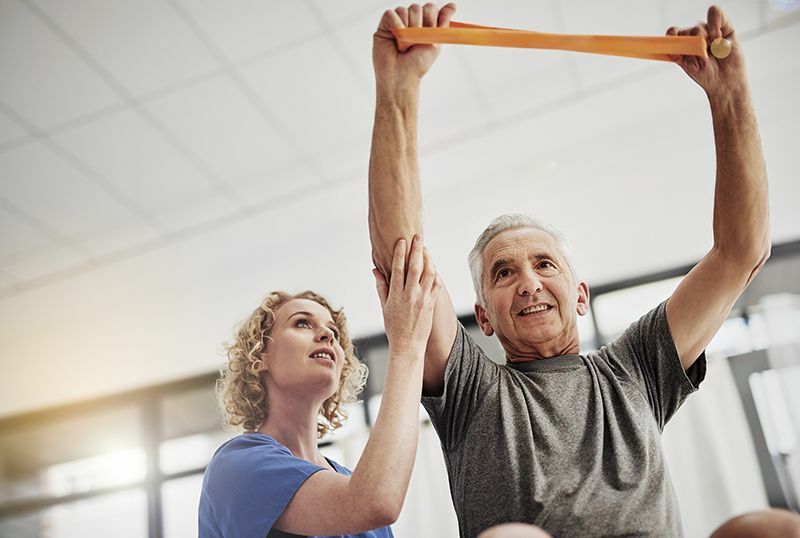 Physical therapists are also responsible for implementing the program, assessing its efficacy, and making adjustments and recommendations for self-management. Physical therapy is typically provided in a hospital or outpatient clinic; however, in certain situations, patients can benefit from at-home physical therapy. Whether recovering from an injury or seeking treatment for a chronic condition, physical therapy provides a number of benefits. Physical therapy can be customized to your individual needs to help reduce or eliminate pain, improve mobility, speed recovery, and prevent future injury. It is beneficial in cases of acute injury or trauma, as well as chronic conditions such as diabetes, heart disease, lung disease, and vascular conditions. Undergoing physical therapy could also reduce your treatment costs. According to one study, initial treatment costs may be reduced by up to 50% when the original primary care consultation is followed by referral to a physical therapist prior to advanced imaging. Furthermore, using physical therapy as a primary treatment strategy results in 72% fewer costs during the patient's first year of treatment. What Is In-Home Physical Therapy? Physical therapy can be provided in a variety of settings. For patients who are hospitalized, therapy can be provided in the hospital – sometimes even in the patient's room. For outpatient physical therapy, many patients travel to an outpatient physical therapy clinic. Other options include nursing home physical therapy and in-home rehabilitation services. Physical therapy home visits may or may not be covered by insurance – it depends on the individual plan and carrier. In most cases, the service will be covered if the patient can demonstrate significant barriers preventing them from accessing outpatient physical therapy services. What Are the Benefits of Physical Therapy at Home? The primary benefit of at-home physical therapy is, of course, the fact that it is provided in the patient's home. In-home physical therapy services are particularly beneficial for elderly patients and patients whose condition limits their mobility to the point that leaving the home could be difficult or even dangerous. This is true for patients who have experienced surgery, a stroke, a heart attack, or physical trauma, and for patients with mobility-limiting conditions like Parkinson's and multiple sclerosis. Physical therapy for elderly patients is often focused on improving functional mobility and quality of life; thus, providing services in the patient's home enables the therapist to cater the therapy to the patient's specific needs. Is At-Home Physical Therapy Effective? There is some concern that physical therapy provided in the patient's home may be less effective than therapy received at an outpatient clinic. It is true that in-home rehab may be somewhat limited in terms of equipment and exercise tools, but there are ways to work around these limitations. A licensed physical therapist is trained to utilize the resources available to maximize the patient's benefit. Physical therapists can also bring light equipment and accessories to use in the patient's home. Though there is limited scientific data regarding in-home rehabilitation services, some studies show that at-home physical therapy is at least equal in efficacy to outpatient services. One 2016 study published in the journal Orthopedic Nursing compared the functional outcomes of patients receiving only outpatient physical therapy with patients who received in-home physical therapy followed by outpatient physical therapy. The results of the study showed no significant difference between the two.